Excitement was pervasive when the Punjab government decided to build a small dam to store rainwater for irrigation in a northwestern part of Jhelum district in 2004. The project promised to bring a fundamental change in the traditional way of agriculture — waiting for rains to irrigate farmlands. It promised to make irrigation water available throughout the year, as and when local farmers needed it. Many of them, therefore, willingly sold their fields to the government so that the dam’s reservoir could be built on them. In an area where only a small portion of rainwater can be used for agriculture – the rest of it flowing into streams and rivers – the dam was projected to store 1,733 acre feet of water, enough to provide one foot of water for more than five times a year to each of the 315 acres of land in three nearby villages. The dam – along with a 22,000 feet long canal to take its water to the fields – was completed in 2008 at a total cost of 57.13 million rupees but its promised advantages never materialised. It could not store enough rainwater that would flow into its canal. The dry canal, in the meanwhile, has ceased to exist in many parts due to a lack of monitoring and maintenance. The project’s failure has resulted in as much despondency as the excitement it once generated. Local residents like Hussain are full of complaints when they talk about it. To reproduce just one of their grievances, they allege that heavy machines that worked on the dam have romped upon and excavated local pastures – where their animals once grazed – to the extent of damaging them irreparably. In the absence of rainwater storage, Dhok Mughalabad and its neighbouring villages of Fateh Pur and Alipur rely heavily on the extraction of groundwater for irrigation. This has caused the local groundwater level to go down drastically – to nearly 500 feet – which makes it extremely costly to extract it overground. When Muhammad Rashid, a 75-year-old resident of Fateh Pur, approached officials of Punjab’s agriculture department to ascertain the cost of a water extraction turbine that could work effectively with such a low water level, he was told that it will require 300,000 rupees to install. It was prohibitively expensive for him. Many other farmers, especially those with smaller landholdings, are facing a similar situation. They are finding it almost impossible to finance turbines capable of extracting water from great depths. Underground water in the three villages is also too salty to be fit for human consumption. The villagers have to travel long distances just to fetch water to drink, says Rashid. “If this situation remains the same, we will have to migrate from here,” he says. 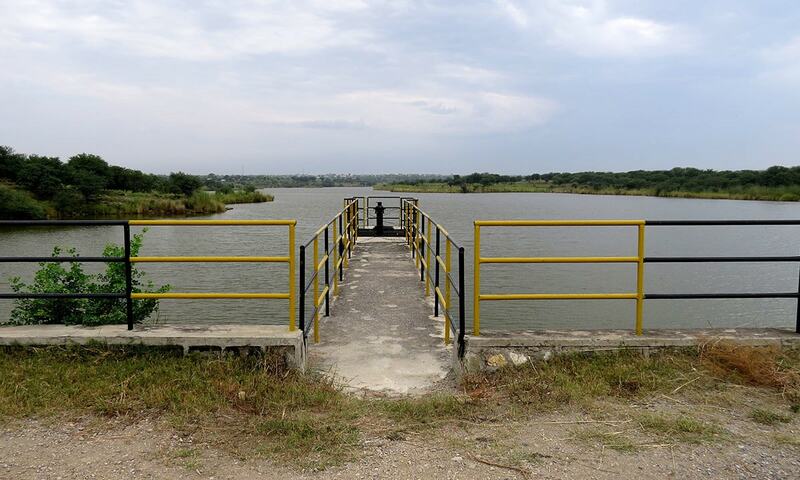 A small dam was constructed in 2008 near Jammergal village, 55 kilometres northwest from Jhelum city. Costing 43.427 million rupees, it has a putative capacity to store 1,655 acre feet of water, sufficient to irrigate as much as 450 acres of land. It, too, has never accumulated enough rainwater to let that flow in its canal. Its costly structure is going to ruins with every passing day. The problem with this dam is that the bed of its reservoir is too porous to hold water. Rainwater flowing into the reservoir is “percolating” underground, explains Muhammad Azeem, a Jhelum-based executive engineer of the irrigation department. “Although percolation happens at almost all dam sites but it is very high in the case of this particular dam,” he says. The possibility of a high rate of percolation, according to Azeem, should have been taken into account before the construction of the dam through what he calls a “subsurface investigation” of the proposed location of its reservoir. This investigation was not carried out, he says, because of its high cost. Another dam, built in 2005 at a cost of 125.943 million rupees and meant to store around 6,000 acre feet of rainwater for irrigating around 2,220 acres of land, is similarly non-functional though for a different reason. Its water outlet was badly damaged in 2014 so the irrigation department stopped supplying water to farmers. Officials feared that allowing water to flow from the damaged structure could result in the dam’s collapse and flooding of the nearby village, Patha Wala Kas, situated around 15 kilometres to the northeast of Dina town, also in Jhelum district. Four years later, the broken structure still awaits mending. The stay order is yet to be revoked. Chaudhary Sajid provides tenting and catering services in Chakwal district’s Balkasar town. A strapping tall man in his late forties, he remembers how the most glittering tents in the town were used for holding a public ceremony on April 13, 2006 when Pervaiz Elahi visited the town as chief minister of Punjab to lay the foundation stone of a large water reservoir next to a nearby village, Dharabi. The dam was to have a gross water storage capacity of 37,000 acre feet, enough to irrigate 6,400 acres of local land. The excitement did not last long. “The project ended up bringing more distress than happiness for us,” says Sajid. The dam was originally scheduled to be completed in 2007 but political turmoil that year and a subsequent change in government the next year meant that it did not receive the funds it needed for completion. The construction finally came to an end in 2012 – with an expenditure of 341.991 million rupees – but with a flawed design and poor construction quality. Due to its design flaw, the dam’s 131,800 feet long irrigation channels run much lower than the land they are supposed to irrigate — rendering them useless for carrying water to the fields. Even the dysfunctional canals have been badly damaged over the last six years. In some places, they are as good as non-existent. The government is also doing nothing to address another problem linked to the same project: local farmers who sold their land to the irrigation department for the reservoir are yet to be paid — a decade after the construction of the dam came to an end. “We lost hundreds of acres of land. My family alone lost 58 acres,” says Sajid. Recently, he wrote two separate applications seeking compensation for the land. He sent one of them to the Small Dams Organisation, a subsidiary of the irrigation department which looks after small water reservoirs in Punjab and has its head office in Islamabad. The other he sent to Shehbaz Sharif who at that time was chief minister of Punjab. None of his applications has elicited any response. “The government has spent millions of rupees on the construction of a defected dam but it cannot pay any compensation to poor farmers,” he says with obvious anguish on his face. A dam near Uthwal and Lakhwal villages, roughly 25 kilometres from Chakwal city, suffers from almost the same problems as the one at Dharabi does. Constructed in 2012 at a cost of 436.641 million rupees, it has a gross water storage capacity of 18,000 acre feet and was supposed to irrigate 3,500 acres of land in more than half a dozen villages but it has not become functional even though six years have passed since its construction was completed. It, in fact, became dysfunctional as soon as water was released in it. One of its main pipelines – that was supposed to take water out of it and release it into an irrigation channel – burst under high water pressure during an initial test. No repair work has been done on it since then. “The authorities showed us this dream that we will receive enough water after the construction of the dam to grow vegetables, maize and even sugarcane but unfortunately we are still living at the mercy of clouds and rain,” says 82-year-old Muhammad Nawaz, a wrinkle-faced resident of Lakhwal village. What adds to the horror of their shattered dream is the fact that, just like farmers in Balkasar, they have received no compensation for the lands acquired from them by the government for the construction of the dam. Not that the government has made no efforts to change the situation for the better. A few official documents did move around. Plans were made, at least on paper, to rehabilitate both dams – the one at Dharabi and the other at Uthwal and Lakhwal – as Chakwal-based officials of the Small Dams Organisation prepared a feasibility report about three years ago, seeking 900 million rupees from the provincial government to make the two dams functional again. The paperwork, though, led to no practical action. According to a report published in daily Dawn on January 31, 2016, the organisation sent the feasibility to the National Development Consultants, a private consulting firm that specialises in designing dams and offering engineering services for water resources and sewerage. The firm, the newspaper reported, demanded 1.25 billion rupees to restore the dam at Uthwal and Lakhwal and another one billion rupees to rectify design flaws of the one at Dharabi. Keeping in view the huge sum of money, the projects were dropped. The irrigation department and the Small Dams Organisation then prepared another set of feasibility reports with help from the National Engineering Services Pakistan (NESPAK), a state-owned consultancy firm. These reports have led to the setting up of a committee at the Punjab civil secretariat in Lahore with the mandate to look into whether the rehabilitation of the dams should be approved and if yes, then at what cost. “This committee will approve or disapprove the new feasibility reports after carefully examining them,” says Irfan Nazar, who represents the Small Dams Organisation in Talagang area of Chakwal district. Though he remains confident that rehabilitation work will start soon and the dams will become operational within a year, he does not know how much money will be required for the purpose. “The exact budget will be determined after the approval of reports by the committee,” Nazar says. What if the money is too much for the government to provide? He has no idea what will happen in that case except that the dams will remain as non-functional as they are now: temples of modernity providing no solace to their devotees. Muhammad Zameer, a 56-year-old retired soldier who runs a small grocery shop from a room in his small house in Chakwal district’s Khai village, has an angelic smile though his words are often laced with despair. Crops on his small farm spread over eight acres of land were destroyed twice in 2013 after a dam situated next to his village failed. When the dam’s sluice gates were first opened after its completion, its irrigation channels burst and flooded crops on hundreds of acres besides damaging a number of houses, Zameer says. This happened again when a second unsuccessful attempt was made to release water from the dam, he says. 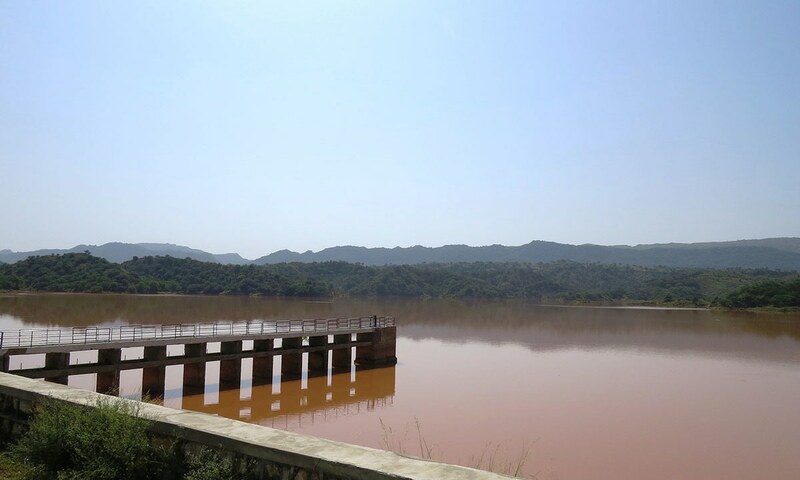 The dam at Khai is built on a seasonal rivulet near the scenic Kallar Kahar region located next to the motorway that links Islamabad and Lahore. It was constructed at a cost of 169.819 million rupees to irrigate 1,800 acres of land. Though it is full of rainwater – a good 5,920 acre feet of it – its 34,600 feet long canals and irrigation channels are all broken down. They cannot carry any water to the fields. An irrigation department official in the area acknowledges that corruption and irregularities marred the construction of a number of local dams, including the one at Khai. And just like what large-scale construction activity has done to a dam site mentioned earlier, communal pastures at Khai have all been wrecked due to the lifting and moving of earth from and through them with heavy machinery. “We have to travel 12 kilometres to fetch animal fodder alone,” says Allah Daad, 65, who is playing cards with some others at a tea stall outside his village on a recent September day. “It would have been better if the dam had not been constructed at all,” he says. A report, titled Pothohar Climate Smart Irrigated Agriculture Project, was prepared in 2016 by four private national and international consulting firms in collaboration with the World Bank and local authorities. 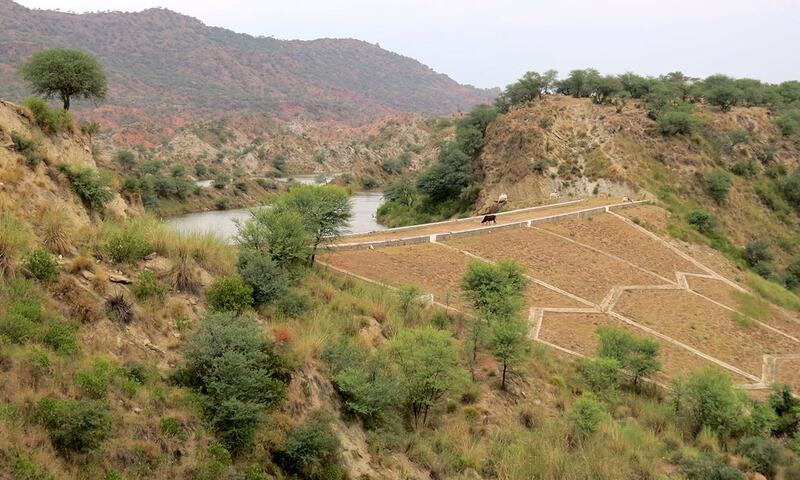 It stated that agriculture in the Potohar region – that consists of Rawalpindi, Attock, Chakwal and Jhelum districts as well as the federal capital, Islamabad – could benefit enormously if small dams and other man-made structures were built here to conserve rainwater during the monsoon. The Potohar plateau, according to the report, covers nearly 7.5 per cent of all cultivable land in Pakistan and includes some of the most fertile parts of the country. But, in the absence of small dams and other similar structures, only “less than 14 per cent of the total [rainwater is captured in the region] to support irrigation systems”. Consequently, merely 11 per cent of the cultivated area in the region was “equipped with irrigation systems” as recently as two years ago. The rest of the farmland in Potohar remains rain-fed with very low crop productivity. 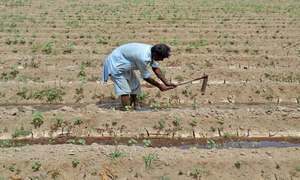 “The agricultural yield of wheat, barley, maize and mustard [in Potohar is] roughly 59, 29, 367 and 66 per cent lower, respectively, relative to canal irrigated regions in the Punjab,” read the report. The authors of the report then looked at existing dams and other irrigation-related infrastructure in the region and came up with shocking revelations. “Roughly 50 per cent of available small dams in the region” irrigate less than 95 per cent of their command area, the report said. Another 25 per cent of the local dams provide water to less than 80 per cent of the land they are supposed to irrigate, it added and cited canals damaged by bursting, leaking pipelines and poorly constructed water outlets among the reasons for the below par performance of small dams in the region. Consequently, the report concluded, 54 different dams in Potohar irrigate only 34,000 acres of land — almost half of the 67,892 acres they are supposed to be irrigating. The situation on the ground is perhaps even worse. As many as seven small dams were found to be totally dysfunctional. Built with a total expenditure of 1.26 billion rupees and located at Dharabi, Uthwal and Lakhwal, Jammergal, Fateh Pur, Lehri, Jamal and Khai villages, these are not irrigating even a single acre of land. Most of them have been non-operational since their completion. Seven more dams have never provided water to more than 10-15 per cent of the land they are supposed to irrigate. Another 12 dams have been irrigating 50 per cent – or even less – of their command area. The report was originally prepared with the aim to seek money from the World Bank for the construction of 25 more small dams in Potohar but the World Bank refused to provide money for them, citing “some serious concerns” about the pathetic condition of those structures that already exist in the region. The Small Dams Organisation, set up in 1960 with the specific purpose of constructing and running small dams in Potohar, cites major institutional and financial constraints as reasons for the large-scale failure of small dams. Syed Tasneem Shah, who works as a project director at the organisation, complains of shortage of both human resources and money needed to maintain and rehabilitate existing dams in the region. More than half of the sanctioned posts of different ranks at the organisation have been lying vacant for many years, he says. The current number of its regular staff is 612 even when it is allowed by the government to hire as many as 1,231 officials in regular category. Money is perhaps an even bigger problem. “As many as 29 dams – out of a total of 60 built by the Small Dams Organisation in Potohar – have not received any money for their upkeep since their construction,” he says. This is because, he argues, his organisation receives less than half the money it requires each year to keep all the dams under its jurisdiction in working condition. “The amount of money we need annually for the purpose is 304.964 million rupees but what we receive from the provincial government on this count is 112.607 million rupees a year,” he says. Not all of this money gets spent on the maintenance and rehabilitation of dams either. Around 30 per cent of it is paid as salaries for workers temporarily hired to overcome staff shortage at the organisation. Retired Lieutenant General Abdul Qayyum is a Pakistan Muslim League-Nawaz senator who hails from Chakwal. In 2016, he highlighted the issue of dysfunctional dams in his native district during a Senate session. Responding to his queries, the then federal minister for water and power, Khawaja Muhammad Asif, admitted that many dams did not benefit local farmers even when huge amounts of money had been spent on them. He also said an inquiry was being conducted to single out those who were responsible for flaws in the design of the dams as well as for the poor quality of their construction. Later the same year, Qayyum brought the issue to the notice of Shehbaz Sharif, who was then Punjab’s chief minister. He ordered his official inspection team to carry out an inquiry into the dams built at Dharabi and Uthwal and Lakhwal. The chief minister’s inspection team charged around six officials of dereliction of their duties, says Qayyum in an interview, but they were not given any punishment. The outcome of an even earlier official probe, conducted in 2011, is still far from being final. It was carried out after revelations that 20 small dams, constructed between 2000 and 2010 with a target to irrigate 30,000 acres of land in Potohar, were irrigating only about 2,044 acres — less than seven per cent of the target. All these dams, built with a total expenditure of 2.62 billion rupees, suffered not just from design problems but were also constructed with poor quality materials, say two news reports published in daily Dawn on October 28, 2011 and April 4, 2013. The inquiry concluded that 12 irrigation department officials had committed serious financial and technical wrongdoings during the construction of three dams in Attock district. It also found three construction companies – Nazar Khan Construction, Gullan Khail Group and Finco Construction – guilty of carrying out defective construction of those dams. The Punjab government later blacklisted these firms. The guilty officials, too, were penalised according to the magnitude of their guilt. Three of them were sacked; two faced compulsory retirement; and pension and other remunerations of the remaining officials were withheld for five years. Khokhar Zer village is located some 20 kilometres south of Chakwal city. Its residents appear to be doing well even when most of them own only small pieces of land. Their apparent prosperity is linked to the fact that their agriculture is not dependent on rain. Their crops thrive because they are irrigated by a couple of nearby dams and the availability of irrigation water throughout the year allows them to cultivate all those crops that can be cultivated anywhere in the country — maize, sugarcane, vegetables. The dams – located near Khokhar Zer and Surla villages – were constructed at a cost of 36.84 million rupees in 1979 and 1985, respectively. They have a combined capacity to store 5,217 acre feet of water and irrigate 2,500 acres of land. They also supply three cubic metres per second water to Chakwal city every day. Their irrigation channels, built after proper planning and with good quality material, have been functioning without a hitch for more than three decades now. 54 different dams in Potohar irrigate only 34,000 acres of land — almost half of the 67,892 acres they are supposed to be irrigating. This general sense of gratitude is sometimes marred by complaints about how government officials assigned to operate the dams do not perform their duties honestly. Iqbal, for instance, alleges that those officials supply water on preferential basis to landowners who have political connections. “Local political families get water whenever they want but small farmers with no political links have to wait to draw water until the officials are in a mood to entertain their requests,” he says. These are but minor inconveniences. As farmers elsewhere in Potohar can testify, dishonest officials can lead to ruin even the best of the schemes for people’s welfare. The writer is a PhD scholar in sociology at Government College University Faisalabad. Are we progressing forwards or regressing backwards? We are losing the ability to even maintain the infrastructure we do have! Instead of intervening with big projects, the government is requested to put its own house (honest and able officers and technical staff in the Irrigation department) and then let them first bring existing projects back to life before kicking off new ones! Are we living in such time that projects over projects are failing. Why on earth simple projects in our country fails? Rizwan, very good article. thanks for highlighting this important issue when whole nation is crazy about dams. All the sad stories lead to one conclusion, apathy, lack of competence, lack of proper work methodology i.e. to carry out proper surveys and feasibilities, lack of serious attitude to the work we do and professionalism. All those characters or a national hallmark of Pakistani professionals be they doctors, accountants, lawyers, urban planners, even security agencies, judges or be they irrigation. We all lack those good cahracteristics because we do not have good training, we know that if we wait and get in the queue we will not get our share. We are not honest so we do not pay compensation to those who contributed their lands. What else, its visible in every sphere of life. The title is a misnomer. The problem is not with small dams but with the manner of construction. Poor design, defective construction, misassessment of water flows, inadequate soil surveys are the culprits, a testimony to pervasive Punjab government corruption. Go get ‘em Imran Khan! The dismal state of affairs in almost every field plagues our economy. Our only hope is the new government. Height of incompetence?Same problem being faced by rain fed areas along Terbela Dam lake at Huripure HAZARA. Who can now disagree that corruption is not our biggest ailment. It is not a "small dam" problem but a corruption & negligence problem. Is there anything in Pakistan that has not been robbed by looters? You are wrong, dams are not creating problems it's the dishonest and incompetent official we can not benefit. At least these dams will contribute to increase the ground level water. You can also use these dams for fish farms, make them tourist attractions???? Water is everything if Someone can think with open mind. Some directional references are not correct but overall great article.